"In every walk with nature, one receives far more than he seeks." -John Muir. 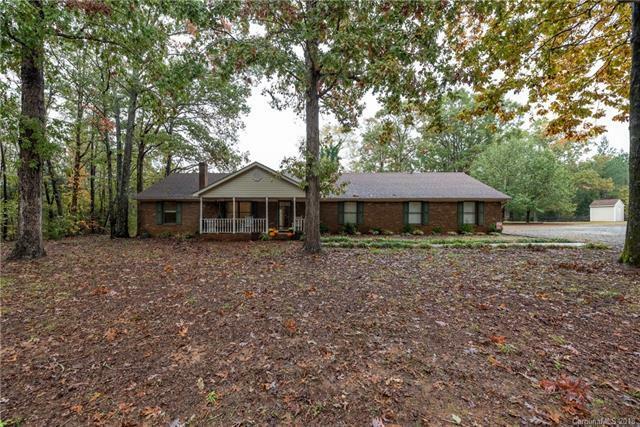 Are you craving privacy, nature, LAND AND a wonderful Brick Ranch home on over 5 beautiful acres?!! Minutes from the luxuries of downtown Waxhaw & the joys of Cane Creek. This perfect home greets you with grandness as you enter the great room with a vaulted ceiling. Note the amazing wood stove(that will keep you warm all winter long) & open floor plan with precious built ins! The dining room and kitchen provide easy living and space for all your people. Bedrooms and bath on the west wing are gracious in size. The master is exceptional with room for 2 king beds if you want to get crazy! The laundry room lends to amazing storage and easy outdoor access. Incredible 1540 sq ft Detached Storage/Garage/Workshop. 7x15 Room in Garage has lots of potential. Additional Storage in Detached Garage. New updated master bath! Front road just paved!Get home by the holidays and come buy this estate now. The data relating to real estate on this Web site derive in part from the Carolina Multiple Listing Services, Inc. IDX program. Brokers make an effort to deliver accurate information, but buyers should independently verify any information on which they will rely in a transaction. All properties are subject to prior sale, change or withdrawal. Neither Miller Realty Group | Keller Williams nor any listing broker shall be responsible for any typographical errors, misinformation, or misprints, and they shall be held totally harmless from any damages arising from reliance upon this data. This data is provided exclusively for consumers' personal, non-commercial use and may not be used for any purpose other than to identify prospective properties they may be interested in purchasing. © 2019 Carolina Multiple Listing Services, Inc. Data last updated 2019-04-25T17:59:05.193.